The foundation is looking for volunteers who want to help make the Garrison Creek corridor into an environmental haven. Participants in a Garrison Creek walking tour organized as part of the Homegrown National Park program. Photo by Jeremy Kai. It’s hard to picture a proper national park smack in the middle of urban Toronto, but a new initiative from the David Suzuki Foundation is encouraging the city’s residents to imagine how it could happen in the west end. The foundation’s Homegrown National Park program is searching for 25 individuals or small teams who live, work, and play in the area around the former Garrison Creek. 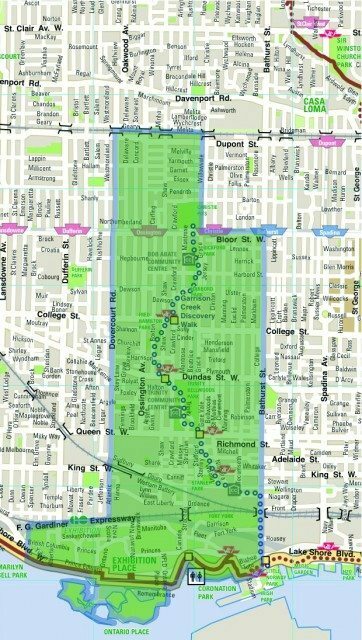 The idea is to assemble a group of locals who want to work to enhance and promote green space in the proposed “park” boundaries, which run from Dupont Street to the Lakeshore, and from Dovercourt Road to Bathurst Street. The 25 volunteers, the Suzuki Foundation hopes, will become “neighbourhood park rangers.” Applications are open until Monday, March 18, and the project will begin with a leadership training workshop on April 6 and 7 at the Centre for Social Innovation’s Annex location. The project was inspired by authors Richard Louv and Douglas Tallamy. Tallamy has promoted the idea of a “homegrown national park,” and Louv has suggested that the idea could be applied to the places where people already live and engage. “We are riffing off their ideas and want to crowdsource a corridor of green by spurring activities like planting and growing and sharing in our backyards, alleys, streets, and green spaces here in Toronto,” Roberts explained. A lot of work has already been done to connect Torontonians to the Garrison Creek area, Roberts said, including the Garrison Creek Discovery Walk, and signage in the area alerting residents to the now-buried creek’s history. 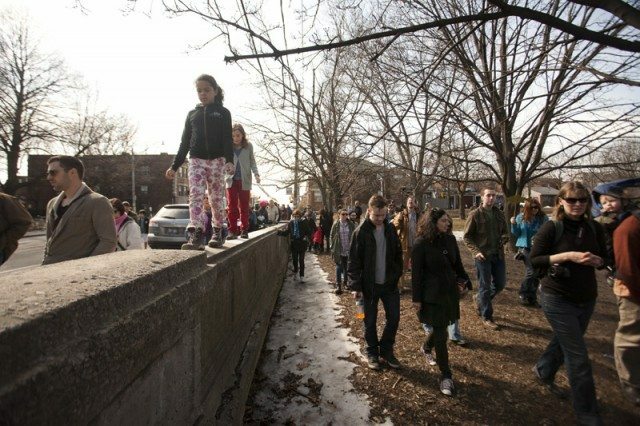 Toronto’s city council has also endorsed a plan to connect the scattered green space in the Garrison Creek corridor, from large areas like Trinity Bellwoods Park to smaller parkettes and street trees. The Homegrown National Park Project hopes to build on that existing awareness. “We want to bring new eyeballs and fresh energy back to these efforts and help bring nature home,” Roberts said. Local response has been positive so far, Roberts said. More than a dozen local groups and institutions—including Not Far From the Tree, The Friends of Fort York, and Evergreen—have expressed interest in partnering with the project. Homegrown also organized a Lost Rivers Walk last weekend with Human River and the Toronto Green Community, which saw more than 120 people exploring the Garrison Creek area. Details on the project and future events can be found at the Homegrown National Park website. Image of proposed park boundaries (right) courtesy of the David Suzuki Foundation.